We discuss the importance of decision making during this process and relevant guidance from the FDA. The FDA just released updated guidelines on procedures regarding changes to 501(k) devices and software. Such changes in design or manufacturing are very common in the industry, so it’s important to understand the regulations as it pertains to your device. Our guest today is Mike Drues, president of Vascular Sciences and international regulatory affairs consultant. He works with governmental agencies and medical device companies around the world. Announcer: Welcome to The Global Medical Device Podcast, where today's brightest minds in the medical device industry, go to get their most useful and actionable insider knowledge, direct from some of the world's leading medical device experts and companies. Jon Speer: Do you have a device that has been through a 510(k) clearance with the FDA? And if so, have you ever made a change to that product? Sometimes when you make a change, it may require that you explore a new 510(k) submission, but certainly, there is guidance from the FDA that can help you with that decision making process. 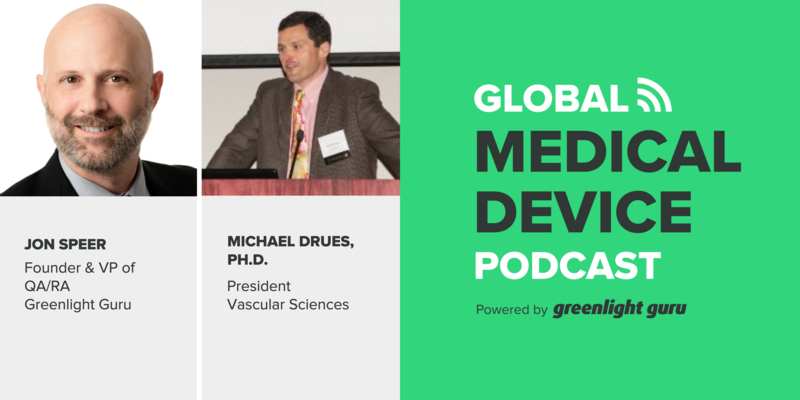 And on today's episode of The Global Medical Device Podcast, Mike Drues and I talk about deciding what to do when you're changing a device that has received 510(k) clearance. So enjoy this episode of The Global Medical Device Podcast. 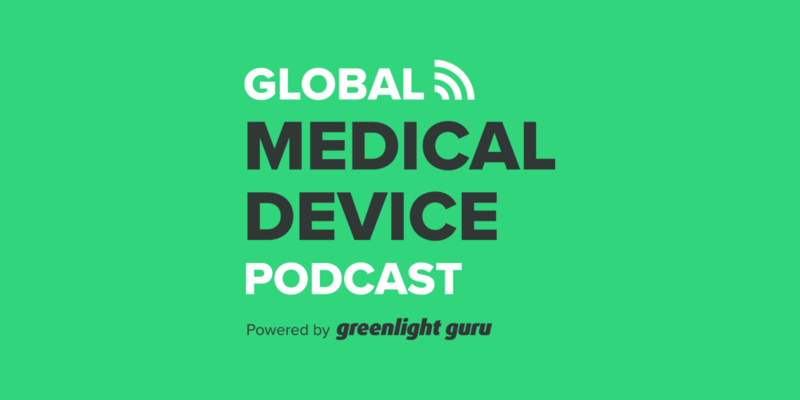 Jon Speer: Hello, this is Jon Speer, the founder and VP of Quality and Regulatory at greenlight.guru and welcome to The Global Medical Device Podcast. Today we are going to talk about 510(k)s, but specifically, really more into changes, what happens when you have a device that's been cleared via 510(k) and now you have a change, what do you do? What's required? My guest with me today is Mike Drues, Mike is the president of Vascular Sciences. Mike consults with FDA, he consults with Health Canada and other regulatory agencies all over the world. Mike also works with medical device companies, big and small, from coast to coast, all over the globe as well. So Mike, welcome back to the program. Mike Drues: Thank you Jon, always a pleasure to speak with you and to work with your audience. Jon Speer: Okay. Well, Mike, see, we're mid-late August, and I think it was just a couple of weeks ago, maybe that even, that FDA came out with new draft guides documents on this topic of changes to a device that has 510(k) clearance, I'm sure you read those right away. Mike Drues: Yes Jon, FDA has put out a number of guidances in this topic over the years, but two most recent that you're referring to came out just on August 8, as a matter of fact. The first called, deciding when to submit a 510(k) for a change, to an existing medical device, and the second, deciding when to submit a 510(k) for a software change to an existing medical device. We can provide links to these guidances on the website, but I just wanna stress that the original guidances, that these are based on, came out in 1997. And so, nearly a decade later, they were finalized. And quite frankly, the reason why this topic is so important to the medical device industry, is because first of all, it happens all the time. Obviously, as you know, the medical device development is very iterative as opposed to... And the drug side of the world where it's really not, a company comes out with a drug and then they don't change anything about it. So, one reason this is important is because it's iterative, but the second reason why it's important is, I have so many examples of companies that I've worked with, as I'm sure you have as well, that have done this and have quite frankly, screwed it up, and have sometimes gotten into an awful lot of trouble. And so I thought we would use this opportunity to share with your audience some of our advice and some of our best practices as to how to avoid this. Jon Speer: Yeah, I think that's excellent. One thing I wanna clarify on the onset is, these two new documents, they are currently draft guidances. The 1997 document that you mentioned, is still, as far as I know, still an official guidance... A released guidance document from FDA. So how does... Do you have any thoughts or comments about how I should evaluate or use released guidance document versus a draft guidance document, especially if they're on the same topic? Mike Drues: Well, that's a good question Jon, and I apologize if I misspoke. You're exactly right, these last two guidances that came out just a couple of weeks ago, are in fact, still in draft form. But that brings us to another topic, perhaps the topic of... Yet another conversation in the future, and that is the difference between a draft versus final guidance. I get calls from companies frequently, they followed everything in a final guidance and yet they're still having problems, and I often say to them, "Well, why would you assume that final means final?" In my opinion, there's absolutely no difference between a draft or versus a final guidance. I don't care what is stamped across the front of it, all of these documents, all guidance, all regulation in general, should be thought of as a work in progress. So bottom line, whether we call it draft or final, I think is really quite frankly semantics, what's more important is the content and the subject matter of what's inside them. Jon Speer: Okay, yeah, okay, that's good, that's good. And here's one of the things, and we're gonna jump into certainly the details, but I think, here's for me, one of the things that I thought was interesting, is that there's now a draft guidance for dealing with software changes. I think that's new, I don't think there's been anything about that for at least, that I'm aware of. Mike Drues: Well, there have been other guidances that have talked about software within them. You may in fact be right, that this might be the first software specific guidance, that I don't know. But I guess more importantly, I look at it this way, if you understand the basic philosophy, the engineering if you will, using regulatory logic as I like to do, and we've talked about before, whether we're talking about changing a physical widget, whether we're talking about changing the software inside of it, or whether we're talking about even the manufacturing process that we use to make that product, managing that change and the kind of testing that we have to do in order to determine whether or not it might affect the safety, efficacy, performance and so on of that change, that always exactly the same. So I really... It doesn't matter to me. I know this might sound a bit odd to many in your audience, but it really doesn't matter to me in terms of the nature of the change, the way I approach it is exactly the same. Jon Speer: Right, exactly. Let's jump into that a little bit. So the premise here is that I have a device, whether mechanical, hardware, software, it doesn't matter, but a device that has received 510(k) clearance and now I'm making a change, it's gonna happen, every single medical device is gonna have a change, it's somewhere along the way in it's life cycle. So, I guess now the big question is, I'm gonna change something, what do I do about it? And why is that important that I keep track of those changes? And why does this guidance document and this draft guidance document? Why does that matter to me? Mike Drues: That's a great question Jon, let's dig into that a little bit. When a manufacturer makes a change, either to the physical design, either to the software or even to the manufacturing process, the company essentially has a couple of options in terms of how they can handle that change. One way to handle it is by simply keeping that information internal, in other words, doing what we call in the vernacular, a letter to file, which by the way updating myself, but sometimes people ask me where that phrase comes from, it's back in the olden times when we actually put a paper in file folders in three drawer file cabinets. So we do the testing, we do the documentation and we don't send it out anywhere beyond our own organization, we simply put it in a letter to file. The other option is to take exactly that same information and package it slightly differently. In other words, instead of putting it in a letter to file and putting it in our three drawer file cabinet, we put it in another box, we call it a special 510(k) or perhaps, a PMA supplement, and then we send it off to the FDA. Mike Drues: The important thing for your audience to understand, and this is at least my approach, is that the information that goes into either of those approaches, whether it's letter to file or Special 510(k) or PMA supplement, the information is exactly the same. The only thing that's different is what we do with it. And quite frankly, if I can go just a tiny bit further, the reason why this is so important to our audience Jon, is because what I really want to avoid is a scenario as follows, you make a change to your device at some months in the future, a knock comes on your door, it's the FDA, they say, "Hey, we notice that you've changed your device. We don't remember you ever coming and talking to us about it, what the heck is going on?" I don't wanna be in a situation where you sit, where we have to say "Oh, gee, we forgot," or worse, "Oh, you caught us." Absolutely not. I wanna be able to say, "Oh, welcome. Hello, Mr. Or Mrs FDA reviewer, come on in, have a seat, let's get a cup of coffee." I don't know whether we're allowed to still give them coffee. Mike Drues: But the important point is, "Let me pull out my letter to file, let me show you the analysis that we went through. Here's the change that we made, here's why we made it, here's the testing that we did to ensure that it does not affect safety, efficacy, performance." By the way, I'm not advocating that we create a PhD dissertation here by any means. It does not have to be a humongous task. But there's gotta be enough information in there to convince somebody that we've done our homework, we know what we're doing, and at the end of the day, we made a business decision. This is not simply a regulatory decision, this is a business decision that we decided that this particular change was not necessary to tell FDA or anybody else. Mike Drues: I wanna make it crystal clear that we're not forgetting, that we're not trying to hide anything, that we're not trying to take any shortcuts, it's just a matter of what we do with this information. And by the way, if we can also, in our letter to file, put two or three examples of other companies that have made similar changes that have also not told the FDA, that would be our icing on the cake. Worst case scenario, worst case scenario in taking my approach, is that FDA would say, "Thank you for sharing all this information, we appreciate what you've done, we think you should have come to us in the form of a special 510(k)." I will say, "Fine, I'll take all this information out of my letter to file, I'll put it into my special 510(k), you'll have it next week." Jon Speer: Yeah. And I think that's the key thing, Mike. I think the problem that a lot of companies are faced with is when the FDA... Mr. Or Mrs. FDA inspector shows up to say, "Hey I noticed the change to your product, show us... I think you should have filed something." And the company's like, "Yeah, no, we decided we didn't need to do that." And they have no documentation to support that. So I think the key take aways are, use these guidances, these guidances are really good, because they... The part that I love about the guidance document, there's all the descriptive part, the words that go along with it, but the parts that I really enjoy are the decision tree flowcharts that are included. I think you can follow those different paths if you're making this kinda change, or this kinda change, and you can just follow that decision tree a lot to guess enough questions. Jon Speer: Whenever I do a letter to file, I like to include that information as well, so that if FDA shows up and says, "I wanna see how you made that decision." I can use their guidance document, the FDA guidance document, show how I went through all of these different options, and how I came to the conclusion that I did, in addition to the other suggestions that you provided about analyzing or providing information about maybe other competitor or similar types of products that have made same kinds of changes in the market place. The key thing is to have an actual documented "letter to file" that you can retrieve, and that you can present and that you can show. I think that's where companies mess up. Mike Drues: I agree. And regrettably, I see a lot of companies get in trouble, and by the way, in situations, it doesn't happen often, but sometimes, when companies screw this up, they find themselves not just dealing with the FDA, but also dealing with the FBI. Mike Drues: Let me tell you, and I'm not trying to scare anybody, I'm really not, I'm just simply trying to illustrate how important this is truly high stakes bingo as I like to call it. If you think it's difficult dealing with the FDA, the FBI, the Department of Justice, those folks don't mess around. Jon Speer: Yeah. I don't imagine that they do, and they all carry badges and some of them carry guns. Mike Drues: That's right. [chuckle] And just what comment I would make on your advice to follow the flowcharts, these guidance have flowcharts, a lot of guidances have flow charts, and I have absolutely no problem with people following them, but I would put a small caveat on that, perhaps, not so small. Recognize that a flowchart is a starting point, it is not a stopping point. I have a very good friend of mine who used to be a senior reviewer at FDA, no longer with the agency, but she has said publicly many times, that every single flowchart that FDA has ever put out, every single one is wrong. Mike Drues: I don't go quite that far, but I very much understand what she means. The flowcharts are very limiting. It's a starting point. I get calls from companies, "We've followed the flowchart, we're still having problems." Well, why would you consider that to be a stopping point? Just yesterday coincidentally, I was at FDA doing a Pre-Sub, and they asked us if we followed a particular flowchart, and we said, "Well, we tried to, but the flowchart would have taken us in the wrong direction." And in one of our backup slides, we were prepared for that question, again, this is a topic of a different conversation, but I was prepared for that question, and I showed them specifically, if we followed the FDA flowchart, that it would have taken us down the wrong path. And FDA said, "Yes, you're right, that makes sense, thank you for not following the flowchart in this particular case." So, I'm not saying, "Don't follow the flowcharts, don't follow the regulation," I'm just simply saying use that as a starting point, but at the end of the day, it's not a substitute for good engineering logic or regulatory logic or whatever you want to call it. Jon Speer: Absolutely. I think, one of the key things to understand is... You and I have talked a lot about design controls, and we've talked about once you get this clearance and now the product becomes a released device and sold into the marketplace and manufactured and so on. And now, on this topic, we're getting into that post-market types of activities, these changes for whatever reasons, and obviously, going through the guidance using that to help determine what path I need to take whether that's letter to file or a Special 510(k) or a supplement or whatever. I think that obviously, that's just good sound engineering practices as we've talked about. So, what are some of the options and consequences? We talked about that Special 510(k), we've talked about PMA supplement briefly, this morning, but are there other options that I need to be considering and what happens if I don't? You mentioned the FDA may say, "Hey, we don't agree, you need to do a Special 510(k)." You talked about the FBI, possibly, can get involved in some cases, are there other things that we should be thinking about as far as the options and consequences on this particular topic? Mike Drues: Well, it's a great question Jon. Fundamentally, it comes down to, given our situation, because as you know, the medical device industry is a very broad industry, and it's very difficult to give advice in very general terms that would be applicable and actionable to your entire audience, because we all do so many different things. But I do think there are some common or recurring themes. And the most important, as we've talked about many times in the past, I'm a huge advocate for doing what makes sense, doing what makes sense from an engineering perspective and from a biological perspective. And then, considering the regulation in this particular case, how we change it. The thing that bothers me about some folks in this business and certainly not everybody, but there are many, they seem to think that the letter to file option is a shortcut, is a way of not doing some basic testing. And as I said earlier, I don't see it that way at all. I think the amount of work that we do, and again, this is not a PhD dissertation. In some cases, it might be a very, very small thing you might be able to do in a couple of days or maybe even a couple of hours, but it's just what you do with that information, do you keep it internal, letter to file or note to file, or do you send it out as a Special 510(k) or something else? I'll give you a very quick example. Mike Drues: A catheter company came to me several years ago, long before this guidance came out. And they wanted to do nothing more than move the logo from one side of the hub of the catheter to the other. And now, to most people, that would seem, "Gee, what a trivial change? Why would we have to notify anybody? Why would we have to do any paperwork? Why would we have to do any testing?" But because they were working with me, we did some testing, and again, this is not alone, but we were able to determine that that seemingly trivial change of moving the location of this logo from one side of the catheter to the other, because marketing was upset when the cardiologist used this catheter, the logo was facing down, nobody could see it, so that didn't make them happy, but by doing a little bit of testing, we were able to determine that this change did impact the way cardiologists used this device, and as a result, could impact safety, efficacy, performance, could change the risk of the product and so on, and as a result, we did notify FDA. Mike Drues: Now, were we required to? That's a judgment call, we were definitely in the gray area. But at the end of the day, whether we take that information and notify FDA or not is a business decision. Some companies, as a matter of company policy, no matter what kind of a change they make will always, should notify the FDA, because their attitude is, "Well, let's not create any doubts here, if there's gonna be a problem, let's let them know about it right away." Other companies will take the opposite approach and say, "No, let's not notify FDA because after all, why create a problem where a problem doesn't exist?" That's a business decision, but at the end of the day, as long as we, as engineers and as medical device professionals, have done what we think is necessary to do, what we do with that information, I think, as we talked about before, is less important. Jon Speer: Yeah. And I wanna dive into that word, notify, a bit, is the only mechanism to notify the FDA, Special 510(k) or a supplemental PMA, is there some other mechanism? Can I just send them a note that says, "Hey, guys, I'm doing this." [chuckle] Most of the time. Mike Drues: It's funny you mentioned that Jon, I'll give you one example where I have actually created a way to do exactly this. In situations where we have changed a medical device but it does not, according to the guidance, according to the flowchart necessarily require us to go to the FDA, but we are in the gray area, I will go to the FDA, usually in the form of a Pre-Sub, and I will say, "Look, we are not asking you anything, we are not required to be here, but in the spirit of growing a positive relationship and working together and kumbaya kind of a thing, we are notifying you of this particular change that we've made to our device. Here is why we've made the change, here is the documentation for it. Here's the testing that we've done to prove, never mind to you, to ourselves, that this is not going to impact safety, efficacy, performance, but because we are in the gray area and because we do wanna be good corporate citizens and so on, we are as a matter of professional courtesy," and that's often the phrase that I like to use, "As a matter of professional courtesy, here, I'm letting you know about it." And at the end of that process, and I've done this several times now, because the regulation does not have a formal pathway, there is no specific type of Pre-Sub meeting that you can request to notify FDA of a change like this, but the regulation does not say that you cannot do this either. Mike Drues: So I use this to my advantage and just like I said earlier, worst case scenario, FDA might say, "Gee, thanks for letting us know, we think you should do this a little more formally." I say, "Well, alright, fine, we'll take this information and we'll put it in a Special 510(k) and you will have it next week." Mike Drues: That's correct. This is actually a post-market Pre-Sub meeting. Jon Speer: Well, I guess, in a sense it is a Pre-Sub in a way, because you're notifying FDA that, "This is a change that we're making." Alright. Let's keep on the same topic but let's dive into maybe an even more gray area that... Well, I've had experience in my prior careers in this space, working in various medical device companies over the years, and that is, this letter to file concept has embraced, adopted, there is documentation to support changes and so on, and so forth, but let's just pick... Let's use your catheter example as one arbitrary example, we have one change where we moved the logo from one side of the hub to the other, and now we make another change because we had to change the material on the lower fittings, on the extension tubes and then we have now another change where we... I don't know, change the guidewire type... I don't know, I can make up, but anyway, what I'm going down this path is; we have a number of small changes or changes where we've evaluated and determined, and every individual case, where the result is appropriate for letter to file, no new submission, no notification required. How many of those little changes can I make on a product before now it's kind of a major change? Jon Speer: The birthday is over, you only need one day for a birthday. Mike Drues: That's correct. But in any event, what you're asking is a very fundamental question, how many changes can you make in an existing medical device? Maybe each of these changes are small enough that you can handle them individually as a letter to file, but eventually, you're gonna come to a point obviously, when all those changes add up to become quite significant, where you would have to notify FDA perhaps as a Special 510(k), or maybe even it would create an entirely new medical device. And the short answer is, since we've been playing this game in 1976, there is no short answer, there is no simple answer to that question. Yes, FDA has to try to come out with regulation, with guidance on this, but there is no simple answer to that. And by the way, if this phenomenon sounds familiar to you or any of your audience, and by the way, it should, because this is a spin on predicate creep, which is, in my opinion, the most legitimate criticism of the entire 510(k) Program, and that is, if you change a medical device and you do a 510(k) comparing it to the device from two years ago, and then the next device which compared two years before that, these changes over a very short periods of time, can be thought of as insignificant, but when you start considering all of these changes in the aggregate, now all of those changes can become very significant. Mike Drues: So with regard to your original question, how does a company know? My best advice, and some engineers like this, and others don't, but my best advice is to take my same approach to ask yourself, not just this change that you're doing now, but all of the changes that you have done since you last notified the FDA. Take them all collectively. In other words, you may have made a logo change, you may have made a color change, you may have made a material change, a manufacturing change, all of these changes individually, maybe you feel comfortable handling as a letter to file, but after a few of them, and I would suggest, perhaps, even incorporating this into your quality system, a requirement after, pick a number, after three letter to file for example, look at all of those changes, not individually, but in the aggregate, and see if now that's going to potentially impact the safety, efficacy, performance, if it's gonna change the risk and so on. Mike Drues: And if you're getting closer and closer to that line where you're not sure, now you might consider going to the FDA perhaps, as this prophylactic, what I would call a post-market Pre-Sub meeting, and say, "Look, we wanna just let you know that we've made over the last year, since this device came onto the market, four changes to our device and individually, they're not significant, but we wanna just let you know that we know what we're doing." That would be my best general advice. Obviously, if any in your audience has specific situations, I'm happy to drill into those in much more detail, but that would be my best general advice. Is there anything that you would add or differ on that approach Jon? Jon Speer: Well, I think it's a really good idea, 'cause I think companies are confused, may not be the right word, but I think there are some companies who are legitimately concerned, "We made this change, we made this change, we made this change, and we don't really have... " Sometimes they're looking to FDA to provide an answer so to speak, and I think your suggestion is really good, is like, okay, we can look at each change individually. But yes, really, this concept that you just described would fit into what I would refer to as product portfolio management, others look at it as product management, where you look at that product oftentimes, that's viewed as a marketing or a business activity which obviously, keeping on the straight, narrow, and on the right path from a regulatory perspective, is important. It's as important as other aspects of managing a particular product. So, I think if we include that, look at how is this product doing, and we bring in the performance history from a complaint standpoint or from a customer feedback standpoint, and just use that opportunity to evaluate all the changes that we made, I think that could be a good vehicle. And I like the idea of the Pre-Submission, you start to make "rule" in your organization where you get to X number of letters to file and then now that triggers a post-market Pre-Submission to FDA, it's a really good suggestion. Mike Drues: Well, I'm glad you like that idea Jon. Quick question, and I know that we're getting short on time, we should wrap this up. But obviously, you are a guru when it comes to quality systems and design controls, have you seen anything like that in any of the company systems that you've dealt with? Because in my case, most of the companies that I work with at least before they start working with me, I've never seen any kind of a requirement in there were after X number of letter to files, you need to look at the changes in the aggregate to do an evaluation. Have you seen that in companies? Jon Speer: I have not, Mike, and I think we're still in this transition period where a lot of companies, when it comes to dealing with the agency are still very much kinda don't ask, don't tell with FDA, And I think, I'm seeing a lot of companies start to embrace, like the Pre-Sub model is a good example. Some companies have realized how invaluable that can be to the direction of your devices and your overall product development strategy. So I'm really encouraged by some of the behaviors, but I think by and large companies are still very much, "We're gonna be hush-hush, we're gonna see the FDA as an adversary and we're not gonna share extra information with them." Mike Drues: Well, that's very unfortunate. Jon Speer: I know. It is, it is right now, and you and I of course, are out there trying to change that. And by talking about these kinds of topics. Mike Drues: But one other piece of pragmatic advice I would give to the audience, and that is, if your company goes above and beyond, for example, if your company incorporates the suggestion that Jon and I have just been talking about, for example, adding into your quality system or your design control, or whatever, I don't really care. A requirement of after X number of letter to files we're going to do this evaluation, which as Jon and I both said, is not required under the current regulation, perhaps, it should, I just think it makes sense. It's what we should do as professional engineers, but when we go to the FDA to tell them... I see a lot of companies come to the FDA and say, "We have a quality system in place, it meets the requirements of blah, blah, blah," with all due respect, talk it's cheap. If we can go to them and say, "Look, not only do we have these systems in place, but we have gone above and beyond because of this particular case, we recognized this as a weakness in the system, and we have actually added this requirement in there." This is exactly why, as you and I have talked about in the past, I do not advocate more regulation for design control and other things, because I think it needs to be flexible enough for companies to do what we need to do, unfortunately, not all companies do it. Jon Speer: Right. I'm with you Mike, I'm with you. And speaking of anniversaries, and on the topic of design controls, we missed celebrating the 20th anniversary of the release of design controls. Jon Speer: No. I think it was... Did it come out '96 or did it become official in '97? I guess... I can't remember the exact year. Mike Drues: I seem to remember '97 but I certainly couldn't go. Mike Drues: Thanks Jon. There's just one last thing I'd like to share with your audience, very, very quickly, along the lines of what you said at the end there, don't fear the FDA. I am working with so many medical device companies now, including some of the largest device companies on earth, who as a matter of corporate policy have said to their R&D engineers, do not change the design or the process used to make your medical device to the point where it would trigger a Special 510(k) or a PMA submission. Only limit those changes to small enough changes that we can handle them as letter to files. As a former R&D engineer myself, this just makes my blood pressure rise. Mike Drues: Because talk about hamstringing the... Combing, now even certainly many people do, but how can anybody argue that this is making the world a better place? So we should not fear the FDA. Listen, I have a huge respect for the job of the FDA. I would defend them more than anybody else when I think they need to be defended, because they do have an awesome responsibility, I think I've shared with you before, one of my friends who used to be at the agency, used to like to say, "Physicians can kill patients one at a time, but an FDA reviewer can kill patients thousands at a time." So have a respect for the FDA absolutely, but do not fear them. And certainly, please, do not let that fear escalate to the point where it actually prohibits you or impedes you from making changes. Mike Drues: One of the things that I pride myself on, is if a company wants to bring a medical device onto the market or in this case, if a company wants to change a device that is already on the market, if they can convince me from an engineering and from a biology perspective of what they wanna change makes sense, and they've done the testing to show that it's not gonna have an impact on safety, efficacy, performance, risk and so on, and so on, then don't worry about the regulatory at all. I will get the FDA, I will sell this to the FDA. If it makes sense from an engineering and a biology perspective, we can make the regulatory work, let's stop as an industry using the FDA as an excuse to stop us from making better products. I think that's something that I would like to leave the audience with today. Jon Speer: And yeah, we're gonna let that be the final word today. I will let the audience know that Mike and I obviously chat every so often. So if there's a topic that you're really just dying to know more about or you wanna get some insights from Mike or from me, just let me know, you can always reply and contact either Mike or myself, you can contact us at greenlight.guru, website's www.greenlight.guru. You can contact Mike, you can find him best or easiest probably, on LinkedIn, Mike Drues, D-R-U-E-S. Mike is with Vascular Sciences. And again, thank you for being the guest on The Global Medical Device Podcast today, Mike. Jon Speer: And folks, design controls, risk management, quality management systems, those are always things that we're all dealing with, and as you're developing new devices and launching them into the market and evaluating changes to your products and the impact of those changes, one thing that you need to consider when you're making the changes in addition to what we've talked about today is; the impact from a design and development standpoint, what verification, validation activities may be required, how does this impact form, fit and function? What are the risk? And you need a good solution, you need good tools, you need to be able to have visibility of those activities so that you can easily assess the impact of your changes as well. So, Mike, thank you and audience, keep listening to The Global Medical Device Podcast.